Numerous studies have confirmed a high Google search position can make all the difference to your eCommerce website’s success, but how do you rank at the top of Google search for highly competitive key search terms and phrases? If you’ve ever asked yourself (or an SEO specialist) that question, you’re probably already aware of the value of ranking number 1 on search engines. Businesses can improve their ROI massively with a targeted SEO campaign. When searching for a product or service online, people don’t often go beyond the first page of a search engine; they trust that Google will bring up the most relevant results first (saving them the ordeal of trawling through pages and pages of content), which is why a high search engine ranking is incredibly effective at increasing sales on an eCommerce website. If you’re not #1, you won’t get half as much visibility or web traffic. Think of position 1 on Google as being akin to having a physical store located on Market Street, the heart of Manchester City Centre. 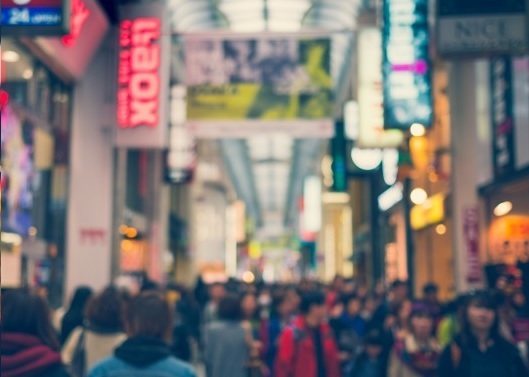 You’ll experience high footfall and increase sales simply because you’re in an ideal location with lots of visibility, and it’s the same with a high search engine ranking. the harder it is to grow. To ensure you have competitive advantage over other businesses online, it’s vital that you implement some kind of SEO strategy. That’s where we can help. If you’re the owner of an eCommerce website, this SEO guide is for you. Before you implement any best practice SEO techniques, it’s absolutely vital that you begin with some online research. Why? Research is the backbone of any successful SEO strategy. Without it, you’re likely to target ineffective, low-converting keywords. How do I conduct keyword research for my business? If you have no experience with SEO, you’ll more than likely be tempted to try and rank only for the keyword “cookies”, but actually, as a ridiculously competitive and non-specific search term (it has over 30 thousand searches a month just in the UK), you’d be better off targeting more long-tail key phrases. Let me explain a little better. 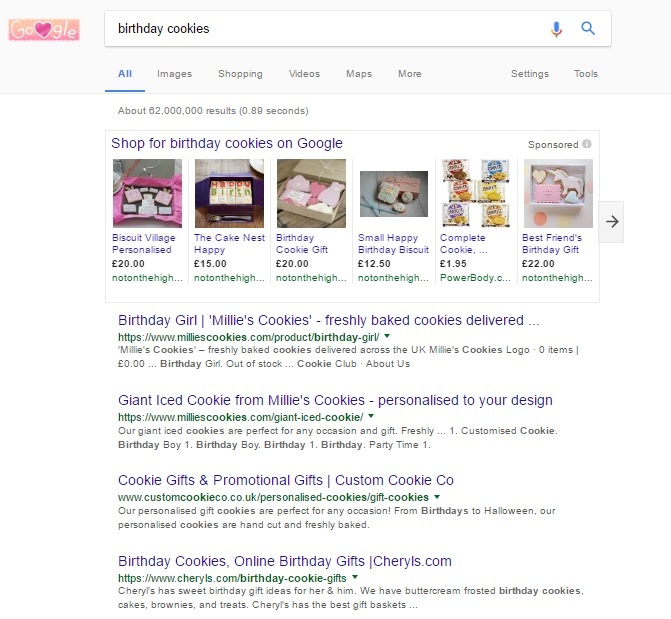 People searching for “cookies” could be looking for cookie recipes, cookie dough, or even information about website cookies. More targeted search terms such as ‘gift cookies’ or ‘personalised cookies’ are much more specific and will therefore attract the right kind of website traffic for your small business – even though they both only have a UK monthly search volume of 700 each. What are long-tail keywords (or phrases)? Long-tail keywords are very, very specific search terms that are relevant to your business, product or service. Despite having a low search volume, they’re often more effective at converting web traffic into sales. For example, more people will search “furniture”, but a person who searches for “grey mirrored wardrobe” knows exactly what they want, which increases the likelihood that they’ll convert (or buy). Ask yourself, what are people likely to search for to find products/services like mine? To make the customer experience as easy and enjoyable as possible, and to improve your search engine rankings and conversion rate, it’s a good idea to segment different products or services on your website. So, as an online cookie company, it’d be a good idea to have separate pages for ‘wedding cookies’, ‘branded cookies’, ‘personalised cookies’ and so on. When conducting keyword research, keep in mind search volume, ranking difficulty and relevancy (there’s no point trying to rank for ‘vanilla cookies’ if you don’t sell that flavour). Remember not to opt for keywords that are too broad or overly competitive. Even if you do manage to achieve a first page ranking for a competitive, un-specific keyword, visitors to your site may not find what they are looking for, leading to a high bounce rate (which can impact your ranking over time) and a poor conversion rate (which no business wants). Using Google’s free AdWords Keyword Planner, SEMRush or another keyword research tool, such as Moz, research keywords that are highly relevant to your product, brand or industry. If you’re a small local business that can only deliver products within the the UK, or you’re only interested in offering services in Manchester or a different area, make sure you implement a local SEO strategy. Try to choose keywords that balance a high local search volume with a low keyword difficulty score. This way, you’ll find it easier to get a page 1 search ranking as the keywords won’t be as competitive. What kind of content will help your online customers? Google rewards honest, helpful and user-friendly websites. Inform visitors about your industry and give them at insight into your brand to increase brand loyalty and SEO. Whether it’s a how-to guide or a blog post about an award that your business has recently won, engaging, useful blog posts are a must! One word of warning: don’t try to manipulate search results by “keyword stuffing” your articles; instead, tailor blog posts around search queries and industry-specific ideas to boost your position on search engine results naturally. We could be here all day giving you the dos and don’ts of writing web content that’s optimised for search engines, but the most important thing is to write for people first, and search engines second. Encourage people to join the conversation by sharing your content across Twitter, Facebook, LinkedIn and other social media platforms you use to reach out to customers! Don’t have the time to commit to writing search engine optimised content or copy? We provide professional SEO copywriting services in Manchester to enable you to do what you do best – run your business! B: How do I analyse my online competitors? Congrats! By conducting keyword research and choosing your primary and long-tail keywords you have successfully formed the basis of your SEO strategy. Take a break (and maybe have a coffee) as the next step involves analysing your competitor data. The easiest way to find your competitors online is to simply type in your chosen keywords one by one into Google and see which businesses are positioned on the first and second pages. Professional tools such as SEMRush and Google Keyword Planner enable you to carry out much more thorough competitor research, including not only the range of keywords your competitors are targeting, but also how your website ranks in comparison. Acquiring high-quality inbound links (also called ‘link building’) is important to any SEO strategy, as they help Google to better understand your website and its pages. This is especially true if your site is brand new. If your competitors can get links from certain websites, there’s a very good chance you will be able to too. However, be aware of links that Google will view as ‘bad’, and never buy links, as these are usually of poor quality and can negatively affect your site’s ranking. There are plenty of link building benefits that are unrelated to SEO, from relationship and brand building, to getting more web traffic (which can quickly transform into loyal customers)! You can discover where your competitors are attaining their links from by using software such as Majestic (arguably the best backlink checker tool) or Open Site Explorer. Oh, and to view your own backlinks, simply view the ‘Links to Your Site’ section on Google Search Console. There are various ways you can acquire external links; try: guest posting, product reviews (don’t post it yourself, send it via email for them to upload), submitting a press release to online local media outlets. A well-thought out website structure can dramatically improve the usability of your site and influence search engine rankings. To gain a better understanding of how businesses in your industry are structuring their websites, you need to do some in-depth analysis. Look at their navigation (is it easy for customers to find what they are looking for?) and try to figure out their internal linking tactics. Remember, don’t just copy a competitor’s site architecture. Really consider what will be best for your customers and, if you can, make improvements to your own website. If they’re a big brand, they may have an SEO agency working with them, but if you need any support, you can always rely on us! Once you’ve gathered your keyword and competitor research together, it’s time to audit your site for errors that could potentially damage your rankings on search engines. You can do this extremely quickly using the SEO spider tool Screaming Frog. It’s free to download and use for crawling up to 500 URLs at a time, but if your site is larger, you’ll need to pay an annual fee. Screaming Frog is fantastic for identifying on-page and technical SEO problems on your site; many digital marketing specialists use it to carry out audits, including our Manchester-based team! Without it, finding broken links (404s), duplicate content, temporary and permanent redirects and much, much more would take a lifetime. You can also use Google’s PageSpeed Insights tool to discover page errors that may be damaging your SEO. Simply type in a web page URL and select ‘analyse’ to find out your website performance score and follow the recommendations! Duplicate content – If your site has lots of duplicate content, it could be penalised (causing a drop in search rankings). Improve your SEO by removing duplicate content and writing unique, easy-to-read content instead. Once you’ve dodged any fatal SEO mistakes, you can concentrate on issues such as page speed (one of the signals used by Google’s algorithm to rank pages). Page speed is a measurement of how fast page content loads, and it’s also better for your eCommerce conversion rate. eCommerce page speed: how slow is too slow in 2017? People like fast sites. A fast site enhances user experience (UX) and Google admires any eCommerce business that cares about the customer experience. Google has confirmed that site speed is a ranking factor, so if yours doesn’t load up quickly, make this a priority for 2017. Use the Moz toolbar to easily determine page and site speed, and put aside some time to read about how improving your website speed will lead to higher conversions. Website visitors, especially those visiting from mobile devices, are an impatient lot! If a page takes what feels like an age to load (around 3 seconds), online customers will abandon your site to look elsewhere. Optimising your website is essentially making every page user-friendly, and as a consequence, Google-friendly. Website optimisation is often called ‘on-page optimisation’, and it involves implementing best practice SEO techniques (that Google recommends) on internal pages within your site. The advantage of on-page optimisation is that you have full control over it, whereas link building and other SEO methods can be more difficult because they’re more reliant on big ideas and the kindness of other people. A client once asked “You don’t need to be a specialist to write a blog post, do you?” Well, technically, no, you don’t. Anybody can write a few paragraphs and upload it as a blog, or homepage content, but there are certain ranking signals that help search engines to identify ’good’ content from a ‘bad’ content (and length is one of them). Think about your title (also called a ‘H1’ or a ‘header’ in the SEO world). You want it to be catchy so that people read it, but occasionally it would help if you included the whole or part of a keyword in it. So, back to the cookie company example, a blog title could be ’10 quirky ideas for personalised cookies’. Note that the keyword ‘personalised cookies’ is included in the title. Structure your content using the appropriate subheader (H2s and H3s). This not only helps search engines to understand important elements within your content, but it also makes it easier to read. Internal linking – Sometimes it can be useful to link your keyword or a related phrase (anchor text) to a page within your website to provide further information, but don’t do this unless you truly believe it to be of value. Struggling to come up with ideas for your blog? Take a walk – a change of scenery can do wonders for your creativity! Make sure your URL structure is easy to understand. Don’t simply have your URL as example.com/324kgldj; instead, www.example.com/blog/quirky-ideas-personalised-cookies would make more sense. Make sure any images you upload have a relevant file name and alt tag. Find out more about meta descriptions and title tags (the visible writing on a search engine results page that links to your site) to draw in more people on search engines. We spoke a little about this earlier, but I wanted to discuss it in more detail. Your website infrastructure can make a huge difference to how people and search engine spiders move or ‘crawl’ through your website, so it’s important to get it right. Any issues and search engines will have trouble crawling and indexing it. 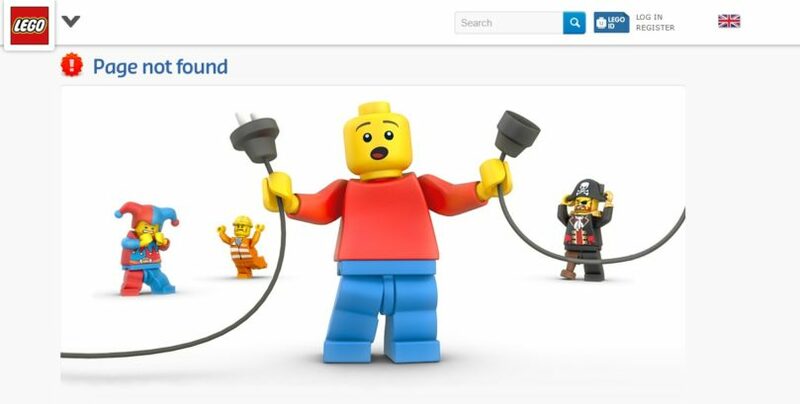 If you ever hear an SEO specialist refer to a website’s ‘back end’, don’t worry – they’re not disrespecting your website, they’re just referring to its infrastructure. This includes the site’s platform, database design, server-side redirects, robots.txt, and other structural elements. Let’s look at the below diagram. If you were an online furniture business, segmenting products into categories and sub-categories (such as ‘living room’ and ‘sofas’) makes them a lot easier to find, increasing usability and sales. As a potential customer, you probably already know what room you want to update, so this approach makes it simple to navigate to the desired sub-category and product. If you need any technical SEO services carried out, our helpful team are just a phone call away! I’ve mentioned the importance of user experience (UX) and usability many times already, but it’s worth driving home. If you’re selling products online, ease of purchasing a product and navigating through the website is arguably more important than any on-page optimisation or keyword ranking. If a visitor has real difficulty ‘adding to cart’, typing in their card details, or performing any desired action, you have a major problem. The easier your site is to use, the more likely it is visitors will return and stay on the site for longer. Fix any usability issues and your ROI will be worth it. Go through the checkout process on mobile and desktop, make it easier for customers to contact you, and make sure site speed is as fast as possible. No matter what changes you make now, bear in mind that enhancing user experience is a continual process. Social media is often viewed through rose-tinted glasses by business owners and marketing graduates alike, but there’s a serious side to social media marketing (even when it does all look like fun and games). Facebook, LinkedIn, Twitter and other social networks are frequented not just by the young, but by older generations and worldwide communities that are all able to share their voice online. It’s thanks to social media that we are able to stay more connected than ever, but many businesses (especially B2B industries and long-standing companies that are only just realising their online potential) still don’t quite understand the value of a social media presence. “How can Facebook, Twitter or Instagram make me money?” they ask. Well, social media is all about forming close relationships with customers and increasing loyalty, but search engines also take into account social signals to rank your website too. Shares, comments, likes, retweets, mentions, regrams and so on all help to inform Google of your value to other people. All social activity will also give you more online visibility. If people are talking about you, it will only strengthen your position on search engines. To grow your social signals and encourage customers to share your content, ensure you remain active across all of your social media channels and add social buttons to your web pages for easy sharing. Using Google analytics, you’ll be able to measure and analyse which keywords have a higher conversion rate, where web traffic is coming from, and even where they’re located. Once you’ve identified your key metrics, you’ll be able to improve your SEO strategy and increase your online success. A useful tip for business owners is to set up Intelligence Events in your Google Analytics account. This alerts you when unexpected events happen to data, such as a sudden drop in conversions or a sharp rise in traffic. As an eCommerce business owner, there are numerous metrics that will help you to improve your online performance. Average session duration, bounce rate, the location of visitors, and much more are likely to be of use to you. You can even use Pay-Per-Click (PPC) campaigns to help find high-converting keywords. Maintaining your website and fine-tuning your SEO strategy is key to long-lasting success. Just because you achieve a high search ranking one day, it doesn’t guarantee you’ll have a high ranking the next day. Your business goals are likely to change over time, and so are your competitors. 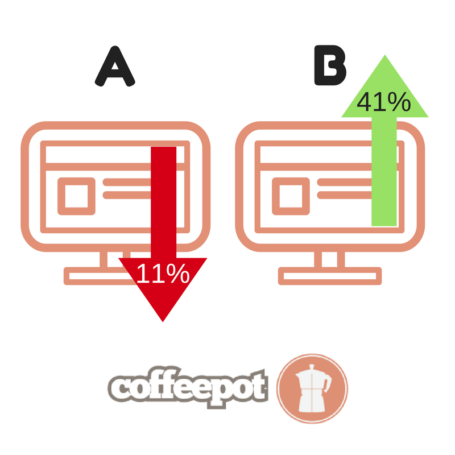 Useful to know: A/B site testing (also known as split testing) is a method of comparing two versions of a webpage against each other to determine which one performs better for conversions or usability. We constantly test client websites using this method, and it’s proven to be a highly successful way of identifying what works, and what doesn’t. Remember, search engine optimisation isn’t a one-time deal, and it requires a lot of time and effort to succeed. Search engines are always improving their algorithms to help people find the best results. If you would like to find out more about how SEO can benefit your eCommerce business, or you need specialist SEO services in Manchester to get your website ranking, get in touch on 0161 236 0390. Did you find this SEO guide helpful? If you’ve implemented any of these SEO methods on your eCommerce site, we’d love to hear about how you got on! We value any feedback so please do get in touch and help spread the word so that other small eCommerce businesses get the results they deserve! As always, if you would like to discuss SEO services for your website, get in touch!